On the night of 5th December children across Germany, Austria and Poland (amongst maybe more countries with a similar tradition) will place one shoe - mostly a boot or welly - in front of their bedroom door or close to the main entrance. If those children are lucky, on the morning of the 6th of December they might wake to find that their shoes have been filled with treats left by Saint Nicholas! As we’re leading up to Christmas it’s fun to learn a bit about some of the other traditions across the world, especially ones that have influenced some of the classic Christmas stories we share with our kids. 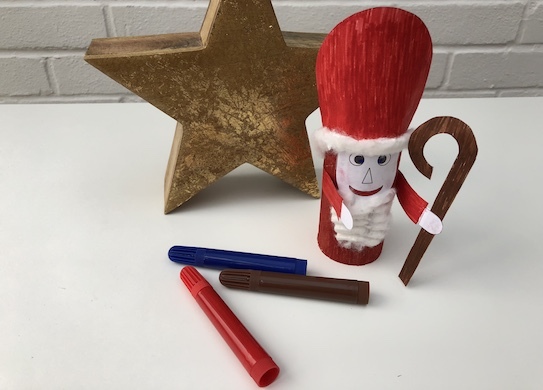 Learn a little more about Saint Nick, make a craft out of a spare toilet roll tube and use this as a great excuse to eat a bit more chocolate (in return for cleaning a pair of shoes!). 1 Cut out the template. Paint the toilet roll and clothes red. Colour in the rest of the pieces. Leave the pieces to dry. 2 Add glue to the back of the face and glue to the top of the toilet roll. 3 Glue the hat over the head and around the toilet roll. 4 Use cotton wool to add hair and a beard. 5 Glue the stick into the hand. Add the arms to the toilet roll tube. What does Saint Nicholas look like? Saint Nick wears a red robe, a big red bishop’s hat and fashions a gigantic white, curly beard. A remarkable characteristic, and one that seems to be pretty popular this time of year. To differentiate him with Santa Claus, his hat is slightly different and he carries a staff (a ‘crozier’). 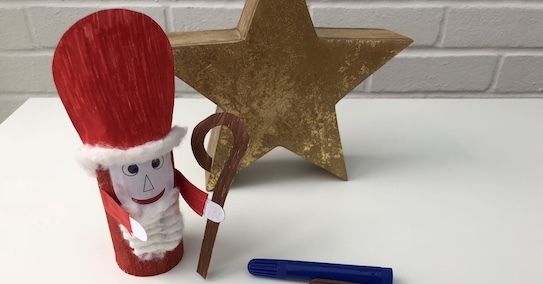 If you’d like to turn your Saint Nick craft into Santa, you can always reshape his hat! Some tales suggest that he travels around on foot, which is a lot of ground to cover over one night! Others say he has a magical horse. My family used to mix traditions and think that he too had a magical sleigh and some reindeer buddies. Much like the children in Netherlands do, we used to put a carrot snack in our shoes on the evening of the 5th. When we woke up in the morning the carrot would have been gobbled up, and in its place a yummy candy cane. Which isn’t a bad trade-off at all. In some European regions Saint Nicholas would deliver the treats personally to the children. In other regions he only secretly stops by during the night. He’s there to see if children have been naughty or nice, because Father Christmas has quite a lot on his plate as it is. He’ll scribble down all the nice names and pass them onto the big man. And the naughty children? Well, that’s another story. Where does the Saint Nicholas tradition come from? The real Saint Nicholas is believed to being born in Turkey around the year 245 AD and became the patron saint of children, sailors, students, teachers and merchants. A few miracles have been credited to him and his feast day became the 6th of December. What do the kids have to do to get treats or small presents? To celebrate Saint Nicholas day, why not pop a carrot in your shoe on the 5th of December, just to see what happens? You never know, you might just have been nice enough this year to get a little something special. It works for many children in Europe, so you should definitely try it as well. The evening of the 5th of December is reserved for kids to polish their boots. A dirty, muddy welly won’t do the trick - if one was to be left, you would risk waking up to find an empty boot. How disappointing would that be? So it’s best to polish those shoes thoroughly. Some children may leave some cookies, nuts or raisins for Saint Nicholas as a thank you for coming to their house. However, you should not only spoil Saint Nicholas and hoping that he will bring you treats. He has magical eyes and watches you and your behaviour for a long time so make sure you are always behaving at your best. Only the kind, nice children receive a treat from Saint Nicholas. The naughty children who do not listen to what their parents or teachers, may end up only getting a wooden switch (bundle of sticks). A switch given by Saint Nicholas was a warning symbol for naughty children to improve their behaviour. So how will you spend the evening? A little treat in return for a pair of spotless shoes? That doesn’t sound like a bad deal at all. All the materials you need to Explore, laugh, create and play. toucanBox is a subscription service delivering fun filled activity boxes to your door.